A few posts back, I wrote about that purple sweater I was finishing for a friend. Well, it is done. It is blocked and dried, all ends woven in. And I’m so unhappy with it. As you can see, it is very big on me – but my friend is larger than I am, so hopefully this won’t be too much of a problem. Also, the collar looks a bit weird. That’s because I read the instructions too fast, didn’t realize it before I was done and so fed up with working with that yarn that I didn’t want to rip back and redo it. Case in point : just before the moss stitch border at the end of the collar, the pattern read : K1, M1, K to end of round. And what did I of course do ? *K1, M1* to end of round. Actually, even if a bit weird, I don’t think the collar looks that bad. My issue is rather with the yarn. Now it has been washed and dried, I do like it a little bit better; the stockinette parts are really soft to the touch. But, as I said when I was knitting it, is extremely unforgiving. Joining between balls showing ? Check (I can make out at least three places on the front in the above picture). Woven-in ends showing ? Check (see left sleeve). I’m not sure how to fix that, so any idea or solution would be welcome. 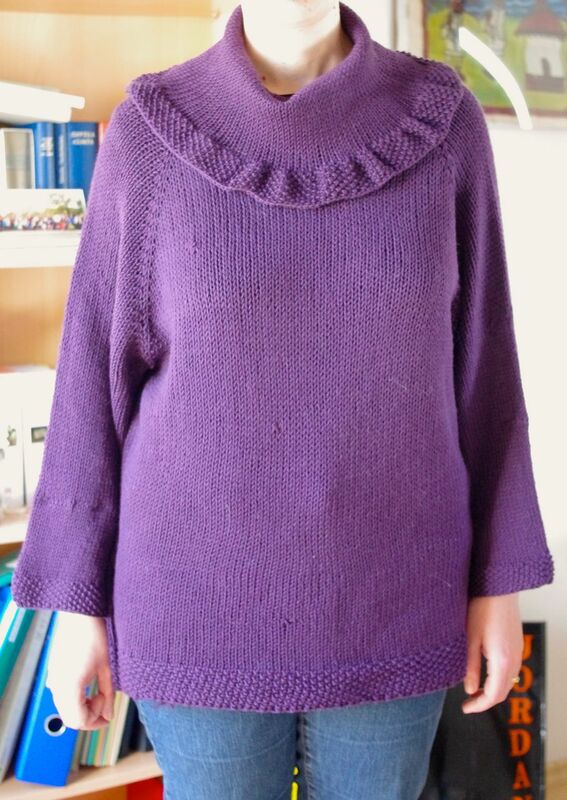 This entry was posted in Finished Knits and tagged frustration, sweater by Julie Paik. Bookmark the permalink.